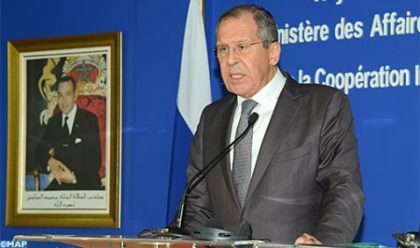 Russia remains in favor of a “mutually acceptable” solution for the Sahara issue in line with Security Council resolutions, Russian Foreign Minister Sergey Lavrov reiterated in Rabat Friday. The Sahara conflict, which has “long lasted”, requires a mutually acceptable solution on the basis of the UN Security Council and with the involvement of all parties, Lavrov said at a press briefing following talks with Morocco’s Foreign Minister Nasser Bourita. “We share the same vision with our Moroccan friends,” said the Russian minister who is on a regional tour in the Maghreb. As to his meeting earlier in the day with King Mohammed VI, Lavrov said the meeting mirrors “shared willingness” to foster bilateral cooperation and implement the agreements sealed as part of the deepened strategic partnership signed between the two countries in March 2016, during the Monarch’s visit to Moscow. Morocco and Russia agreed to give further substance to their strategic partnership following the meeting that was “marked by satisfaction with the implementation, under this partnership, of major projects and actions in priority areas such as agriculture, fisheries, energy, industry and tourism,” the Royal Office said in a statement. Nasser Bourita on his part said at the press briefing that Lavrov’s visit is a landmark event as part of the deep strategic partnership between the two countries that are celebrating the 60th anniversary of their diplomatic ties. He said the meeting with Lavrov raised international and regional issues of common concern including Morocco’s open arms policy towards Algeria. Recent developments in the Middle East were also raised notably in Iran, Syria and Libya, said Bourita, noting that light was also shed on Morocco’s African policy.